Keystone, the manufacturer of the Raptor Toy Hauler has add the 380LEV Fifth Wheel Toy Hauler. The Raptor is constructed with welded 2-inch aluminum framing is at the heart of Raptor’s 5-layer sidewall construction, engineered to make your Raptor strong and durable. Raptor’s structural integrity assures you of strength, superior insulation, and durability for many years to come. 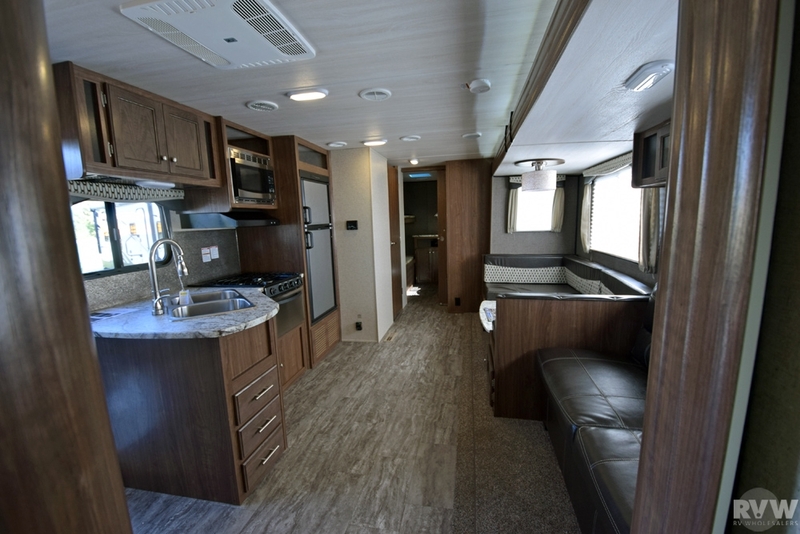 The interior standards include a 50 Amp Service, Bedroom TV Hook-up, Heated and Enclosed Underbelly, Lock Box, Porcelain Toilet with Foot Flush, Shower Surround, Power Bath Vent, Hardwood Cabinetry, and much more. The Garage is over 98″ Interior Width, huge 94″ wide door opening. There are overhead cabinets, a rain-sensor Power Fan, and an air conditioner in the garage. 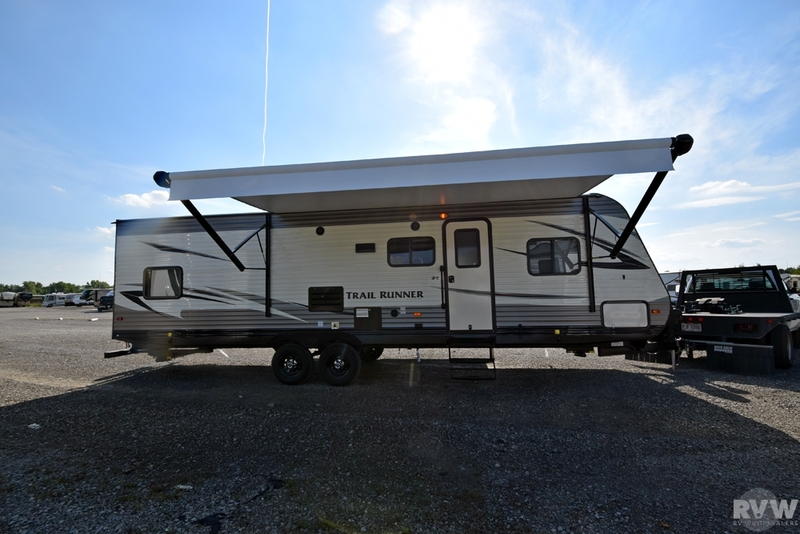 Click here to check out this new 380LEV floor plan. The Tekonsha Prodigy is the latest and most intelligent brake control. This powerful control features new motion sensor technology. With Prodigy no manual level adjustment is necessary, it adjusts itself to varying terrains as you drive. It is equipped with a sensor that detects the tow vehicle’s rate of deceleration, applies proportional braking to the trailer, and features and exclusive “Boost” feature that allows users to apply more initial trailer braking power. For backing into tough spots this is the only inertia control that works proportionally in reverse. A digital display depicts voltage delivery to the trailer during braking and displays continual diagnostics check. Heartland RV has just add the 3850 to the Cyclone Fifth Wheel Toy Hauler to their line up. It features a queen bed in the front slide out, two chairs in the living area, and a U-Shaped Dinette. With a Loft above the garage for sleeping and Dual Queen Bed option in the Cargo Area, there is plenty of room to sleep. The Cargo area also features a half-bath and a table with bar stools. Click here to check out this new 3850 floor plan. The web team just finished uploading the newest look and feel to the Search RVW Inventory section of the site. Guest can now use the Advance Search, by selecting information in the drop down boxes. This is mainly usefull if you already know the type of trailer that you want. There is also a Search by Class, here if you want to see all the Fifth Wheels that we have in stock, just click the Fifth Wheel Logo. The bottom of the page is Search by Brand. This area is usefull if you are looking for a Keystone Raptor Toy Hauler, selecting the logo will show you all the trailers in stock produced by that manufacture. Click here to see the New 2017 Trail Runner 30USBH Travel Trailer by Heartland RV at RVWholesalers.com. Call RVWholesalers.com at 877-877-4494 to talk to a RV Consultant about purchasing this trailer. There is no need to pay more for a New 2017 Trail Runner 30USBH Travel Trailer by Heartland RV when you can purchase the same trailer from RV Wholesalers, The Largest Heartland RV Dealer selling at deep discounts.